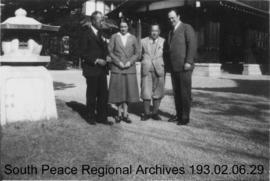 Herman and Beatrice Trelle posed with two men, likely somewhere in Asia, perhaps Japan. Part of the Trelles' 1931-1932 World Tour. 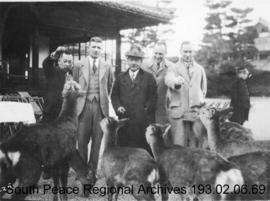 Herman Trelle looks on as a group of men feed several deer-like animals, presumably somewhere in Asia, perhaps Japan.